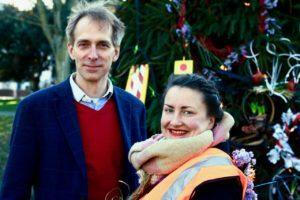 The 16ft tall Christmas Tree was decorated by Ilona Valkonen, a member of the Finnish ‘anarchist florist’ art group Vieno Motors. The tree will stand on the North grounds of St Peter’s Church until early January. Ilona has created the installation combining organic and man-made media, drawing attention to the value of discarded materials, such as electrical wires and bicycle tyres, by re-purposing them as Christmas decorations alongside live, flowering bulbs. The delicacy of the flowers combined with the rawness of the recycled material helps the viewer find aesthetic value in material usually thrown away. The installation of ‘Treecycle’ has been a collaborative effort between Brighton Fringe, The Finnish Institute in London, and a number of Brighton-based organisations; St Peter’s Church, Brighton & Hove Council, Brighton Metropolitan College, Phoenix Brighton and The Finnish School of Brighton. The colourful mix of recycled material was provided by Reuse Manager and recycling genius Cat Fletcher, who has saved them from going to landfill sites in various parts of the city. Treecycle marks the start of a collaboration between Brighton Fringe and The Finnish Institute in London. Brighton Fringe is one of the world’s largest Fringe festivals, and the Institute will take part in creating a Finnish season at Brighton Fringe 2018.